"Although Imagawa Yoshimoto (1519-60), the daimyo of Suruga is a relatively unknown personage in 16th-century Japanese history, he was a pivotal figure in the lives of three great men: Tokugawa Hirotada (1526-49), his son Ieyasu (1542-1616) and Takeda Nobutora (1493-1573). Driven from his estate by Oda Nobuhide, Tokugawa Hirotada decides to appeal to Imagawa Yoshimoto for assistance in 1547. Hirotada's choice is an obvious one as Oda Nobuhide and Imagawa Yoshimoto have been enemies ever since Nobuhide's victory over Yoshimoto at Owari in 1542. Loyalty to his father likewise indebts Ieyasu to Yoshimoto. Around the same time Yoshimoto offers shelter to Takeda Nobutora, the father of Takeda Harunobu or Takeda Shingen (1521-73...). The feud between the Oda and Imagawa clans reaches a climax in 1560 when the Imagawa, though having a greater force of 46,000 men, are crushed by Nobuhide's son, Nobunaga (1534-82), at Okehazama. Yoshimoto is killed during the battle. Later Yoshimoto's son Ujizane (1538-1614) offends Ieyasu such that Ieyasu breaks his ties with the Imagawa and links up with Nobunaga, Ieyasu is only nineteen when he makes this choice, but it is one that marks the first important step of his career as the founder of the Tokugawa shogunate." Quoted from: Heroes and Ghosts: Japanese Prints by Kuniyoshi 1797-1861 by Robert Schaap, p. 106 - with color illustration. Japanese Warrior Prints 1646-1905 by James King and Yuriko Iwakiri provides more information about the background of this print on 286. Also, there is a full page color illustration on page 287. 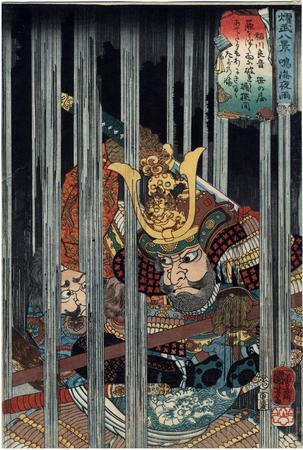 "Even though the subject of the print originates in the Taikōki, Kuniyoshi introduces only a change in spelling to protect himself from the censorship regulations. Inagawa Yoshioto (real name: Imagawa Yoshimoto...), was the third son of Ujichika Imagawa (1473-1526). He was sent to train as a Buddhist monk but, upon the death of his elder brother, he was called back to act as head of his family. Yoshimoto was initially defeated in some battles with Oda Nobunaga's father, Nobuhide (1510-51), but he eventually succeeded in uniting the three provinces of Mikawa, Tōtoumi and Suruga. In 1559, he raised an army in an attempt to retake Owari. He set up his headquarters at Okehazama and the following year attacked Nobunaga's castle and fortifications. is the truss hoop cut into a ring. A 'truss hoop' refers to the circular band around a barrel (oke), but here also alludes to the shape of the Imagawa family crest. A pun is being made between oke, a barrel, and Okehazama, the battle. The fourth line of the poem suggests that the rain helped destroy the Imagawa family."